Wow, great article! Love the asset-based approach to enjoying this architecture. Sure, it's boarded up now, but it has a story to tell, a history longer than any of us, and it has a bit of a voice now, Keri. Thanks for sharing what you see and for seeing what you share! I first laid eyes on this house last year(2009) and I fell in love!! It was for sale for $3400! I waited too late to inquire about it's availability and it was purchased by the Cleveland Land Bank. Just to see the columns, the huge windows, the beautiful brick, it's simply a glorious, architecturally detailed building!! I used to enjoy looking at it as I would go to work via Martin Luther King Drive. It was listed as a 4 unit apartment on the MLS. I hope it can be restored and not torn down. 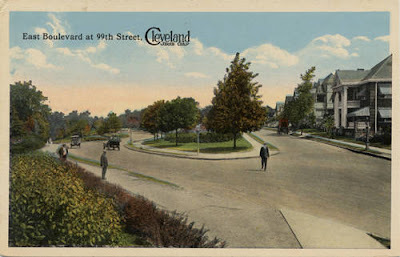 There are so many historically diverse homes and buildings in Cleveland! It's my dream to be able to properly describe and record the century homes in the 44106, 44108, and 44112 zip codes. I'm reasonably sure that there are ways that the house could be obtained through the landmark before they get to the point of demolition. If you're still interested, shoot an email to clevelandareahistory@gmail.com. I'm also interested in talking with you about your project documenting the century homes in those zip codes. I'd be more than happy to oblige! BTW: I hope to close on a house not too far from that apartment building. It's a 1911 Victorian side by side duplex in the Rockefeller Park historic district. Just doing my part to preserve one of many architectural beauties in this area. it is truly my dream house and I'm going to make it happen if God say so.